With Eurocargo, you can have all the assistance you need, thanks to the vast range of services tailored to your requirements, and Iveco’s extensive geographical coverage. Your new vehicle shows total flexibility even at times of need, and will keep you going mile after mile, with absolute professionalism. ELEMENTS Assistance services tailored to suit every mission. 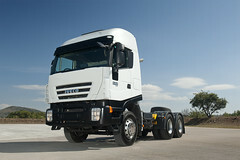 Iveco formulated ELEMENTS with one goal in mind: to provide every customer with service tailored to their needs. A wide range of tailored service programmes, devised to keep your vehicle in perfect shape at all times. ELEMENTS offers specialised, high-quality services designed to give Eurocargo vehicles low running costs, long life and long-term value.